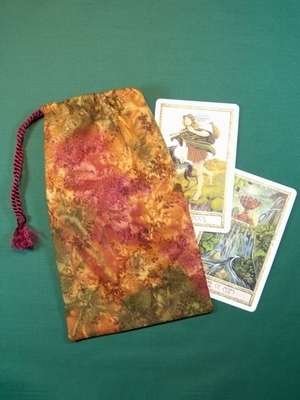 Large Tarot Bags - Samhain Large Tarot Bag - Tarot Bags, Tarot Cards, Cloths, & More! Pumpkin orange, mossy green, burgundy, yellow � all the colors you see in a glorious display of autumn leaves blend together in a celebration of fall. Samhain (rhymes with "COW-in) is an ancient Celtic harvest festival and the precursor to modern Halloween. Falling halfway between the fall equinox and winter solstice, Samhain is a "between time." It marks the day when the veil that divides thisworld from the otherworld is at its thinnest. Spirits are free to roam the earth, fairies may play tricks on mortals, and rituals to honor the dead are common. It's no coincidence that El D�a de los Muertos, All Saint's Day, and Halloween occur at the same time. Size: Measures approximately 6" wide by 10" (15.2 x 25.4 cm). Fits most large or oversized tarot or oracle card decks (up to 5" x 7") and small book.